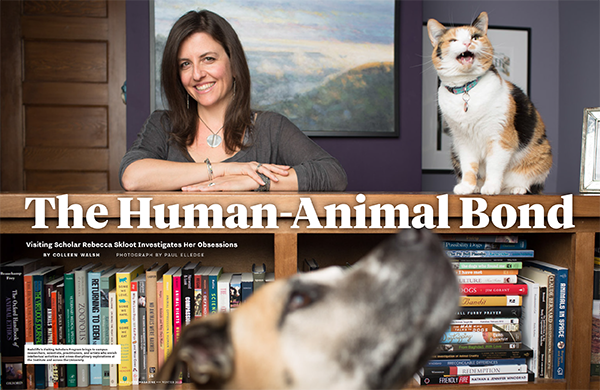 Before becoming a science writer, Skloot spent more than a decade working as a veterinary technician in animal shelters, vet clinics, emergency rooms, shelters, research labs, and an animal morgue. Those experiences, and the ethical questions they prompted, are at the center of her current book-in-progress, which explores the often controversial topic of animal research through a deeply personal story about our complex relationships with animals — their roles in our lives, and in science — and the humans who battle over their fates, and as a result, our own. It’s a topic Skloot has been obsessed with for much of her life, just as she was obsessed with HeLa cells. For her, that core of obsession is the first and most important criteria for writing any story. You can read about Skloot’s book-in-progress in this article from The Radcliffe Institute at Harvard, and you can hear her explain it in more detail in the interviews below (which are the only ones in which she’s discussed her next book to date). In this on-stage discussion with Cheryl Strayed and Steve Almond on Dear Sugars, Skloot discusses her life, her book-in-progress, and her great reckoning with both (starting at time stamp 24:00 on the show). In the video below, you can find the discussion of her next book around time stamp 20:00 (though if you’re curious, at minute 11:00 you can hear her talk about what a derelict she was as a kid). Also this podcast, in which she talk about life, the writing process, and her book-in-progress. For more information, you can also read this brief interview in which she discusses the new book, and her publisher’s announcement of the book.